The United Nations Assistance Mission for Rwanda (UNAMIR) was created by the United Nations Security Council in October 1993. This was just after the end of the Rwandan Civil War. UNAMIR's goals were to help put a peace agreement into place, monitor how well it was going, and support the new government. However, on April 7, 1994, while UNAMIR was in Rwanda, the Rwandan genocide started. The genocide lasted 100 days. During that time, 800,000 people were killed; 2 million became refugees in other countries; another two million had to run away to different parts of Rwanda; and up to 250,000 women were raped. The UNAMIR ended in March 1996. Since the genocide, the United Nations has admitted that they failed to prevent the Rwandan genocide. In a genocide, many or all people in a group are killed because of their ethnicity, religion, or political opinions. In the Rwandan genocide, members of an ethnic group called the Tutsi (abatutsi) were killed because of their ethnicity. The killers were extremist members of another ethnic group called the Hutu (abahutu). The Hutu killers also killed other Hutus whose political beliefs were not as extreme as theirs. In 1994, almost all Rwandan people (85%) were Hutus. However, for many years, the Tutsi minority had more power and ran the Rwandan government. From 1990-1993, the two groups had fought a civil war about who would control the government. This war ended with a peace treaty in 1993. One of the reasons UNAMIR got involved was to make sure both sides obeyed that agreement. However, on April 6, 1994, an airplane carrying the Presidents of Rwanda and Burundi was shot down. Both Presidents were Hutus. Nobody knows for sure who shot down the plane. However, the Hutu extremists blamed a Tutsi rebel group, and right away, they started killing Tutsis. The Rwandan genocide began that day. There were not many countries in the United Nations that were interested in sending peacekeeping troops to Rwanda, even before the genocide started. France was an ally of the Hutu-led government, and did not want to fight it. The United States had just had soldiers tortured and killed in Somalia a year before, and did not want to get into another fight in Africa." Also, many countries thought there was nothing in it for them if they helped Rwanda. Rwanda had no important natural resources, like oil or gold, and it was tiny. It took five months to get United Nations member countries to offer enough soldiers for this mission. Once the genocide started, UNAMIR ran into a serious problem. UNAMIR has to get its "mandate" (its powers, goals, and orders for a mission) from the United Nations Security Council. For this mission, UNAMIR's mandate did not include stopping the genocide or protecting civilians. At this time, UNAMIR soldiers were only allowed to shoot their weapons in self-defence, if somebody was attacking them personally. They were not allowed to use their weapons or get involved to protect civilians who were being attacked. Once they saw what was happening in Rwanda, the UNAMIR Commander, Roméo Dallaire, and Belgian peacekeepers asked the Security Council to give them more power and soldiers to stop the killings. However, the United Nations member countries refused to change these rules for UNAMIR. They and other world leaders talked about the genocide as 'just another ethnic conflict' and said these types of things would always go on in Africa. After ten of its soldiers were tortured and killed trying to protect the prime minister, Belgium pulled the rest of its soldiers out of Rwanda. More and more, UNAMIR's peacekeeping troops were being attacked. Other countries began to copy Belgium and pull their soldiers out of Rwanda. Some members of the United Nations Security Council, like the United States, argued strongly that the UN should take all of its peacekeeping troops out of Rwanda. Eventually, the Security Council decided to decrease the number of troops UNAMIR was allowed to have. On April 21, 1994, as the genocide was spreading across Rwanda, the Security Council decreased the number of allowed UNAMIR troops from 2,548 to 270 – a decrease of almost 90%. UNAMIR's Commander, Roméo Dallaire, kept asking the United Nations for more troops. On May 15, the Security Council increased UNAMIR's allowed number of troops to 5,500. However, it took almost six months for UN member countries to volunteer this many troops. Meanwhile, the genocide continued. French peacekeepers stand guard at the airport. France offered to lead a humanitarian mission in southwest Rwanda while UNAMIR was trying to gather more troops. The Security Council approved this mission on June 22, 1994. France called the mission "Operation Turquoise." In rural parts of the safe zone, mass murders were still happening. France allowed the genocide's leaders to escape through its safe zone into Zaire,[a] without being arrested by French troops. Rwanda's current president has even accused France of helping the genocide happen. France says it never did these things. Operation Turquoise ended in August 1994, when UNAMIR took over the safe zone. Together with the Ugandan army, a Tutsi rebel group called the Rwandan Patriotic Front (RPF) fought the extremist Hutus. Bit by bit, they took control of more parts of Rwanda. Finally, on July 4, 1994, they took control of Kigali, Rwanda's capital city. After this, about two million Hutus ran away from Rwanda to Zaire. This group included many of the genocide's leaders. With the RPF in control of the country, the killings stopped. UNAMIR stayed in Rwanda for about two years after the genocide stopped. It worked on finding homes for refugees, clearing landmines, and helping with humanitarian aid. Meanwhile, the United Nations raised $762 million to help the genocide victims and to help rebuild the country. However, Rwanda did not want UNAMIR to stay in its country. Rwandan leaders told the United Nations that the UN did not help with what Rwanda really needed. It asked UNAMIR to leave Rwanda. In March 1996, UNAMIR did. “ [A]t its heart, [this] is the story of the failure of humanity to heed a call for help from an endangered people. The international community, of which the UN is only a symbol, failed to move beyond self-interest for the sake of Rwanda. While most nations agreed that something should be done, they all had an excuse why they should not be the ones to do it. As a result, the UN was denied the political will and material means to prevent tragedy. Since the end of the Rwandan genocide, many people have blamed the United Nations for failing to prevent or stop the genocide. In 2000, United Nations Security Council admitted that it did fail to prevent the genocide. They said that they could have helped stopped the killings, but they did not. Also, at the time, historic things were happening in South Africa. Apartheid was ending. The international mass media chose to focus on that instead of what was happening in Rwanda. They, like the UN, saw the Rwandan genocide as just another fight between African tribes. Because there was little to no news broadcasts about Rwanda, most people in the world did not know what was going on there. They could not push their governments to get involved. Martin Dominque argues that world leaders may not have wanted to send troops to Africa because they had the wrong ideas about what African people are like. If they thought African people were always fighting each other and always would, they would think the Rwandan genocide was no different. Roméo Dallaire also says he tried many times to warn the United Nations that a disaster was coming in Rwanda. Finally, he sent a fax to the military adviser of the Secreretary-General of the United Nations. He said he had secretly spoken with a leader of the Hutu militia. This man told him his soldiers were trained and ready to kill Tutsis. For example, he said, his soldiers could kill 1,000 Tutsi in 20 minutes. The man said he thought that huge massacres of Tutsis were about to begin. Finally, he told Dallaire where the Hutu militia were keeping many of their weapons. In his fax, Dallaire said he wanted to take action and take away those weapons. If the weapons were not taken away, they would be used to kill Tutsis. The next day, he received a fax back from Kofi Annan, who was in charge of peacekeeping at the United Nations. He ordered Dallaire not to take any action. He told Dallaire that protecting citizens was not part of UNAMIR's mandate. About three months later, the Rwandan genocide began. ↑ Zaire is now called the Democratic Republic of the Congo. ↑ 1.0 1.1 1.2 1.3 1.4 1.5 1.6 1.7 "Rwanda: A Brief History of the Country". Outreach Programme on the Rwanda Genocide and the United Nations. United Nations. Retrieved April 10, 2016. ↑ Immigration and Naturalization Service Resource Information Center (August 14, 2001). "RIC Query – Rwanda: The Role of the Interahamwe Militia During the 1994 Rwandan Genocide". U.S. Citizenship and Immigration Services. United States Department of Homeland Security. Retrieved April 11, 2016. ↑ 4.0 4.1 4.2 4.3 4.4 4.5 Maritz, Dominique (April 7, 2012). "Rwandan Genocide: Failure of the International Community?". E-International Relations Students. Retrieved April 11, 2016. ↑ 5.0 5.1 5.2 5.3 "Rwanda genocide: 100 days of slaughter". BBC News Online. BBC. April 7, 2014. Retrieved April 10, 2016. ↑ 6.0 6.1 6.2 "Rwanda – UNAMIR: Mandate". Peacekeeping Missions. United Nations. Retrieved April 11, 2016. ↑ 7.0 7.1 7.2 Dallaire, Roméo (2005). Shake Hands with the Devil: The Failure of Humanity in Rwanda. London: Arrow Books. pp. 231-3. ISBN 978-0-09-947893-5. ↑ 8.0 8.1 8.2 General Roméo Dallaire. Television interview with Frontline. Interview: General Roméo Dallaire. Frontline. April 1, 2004. Assessed on April 12, 2016. ↑ Kimani, Mary (July 2006). "Protecting civilians from genocide". Africa Renewal. p. 4. Retrieved April 10, 2016. ↑ 10.0 10.1 10.2 10.3 10.4 10.5 Shalom, Stephen R. (April 1996). "The Rwanda Genocide: The Nightmare that Happened". Department of Political Science. William Paterson University. Retrieved April 10, 2016. ↑ 11.0 11.1 Other Genocides in the 20th (and 21st) Century. (PowerPoint.) Eagle Mountain Saginaw ISD. HTML version available here. Retrieved April 11, 2016. ↑ 12.0 12.1 Gourevitch, Philip (December 8, 1995). "After the Genocide". The New Yorker. Retrieved April 13, 2016. ↑ Carroll, Rory (March 31, 2004). "US Chose to Ignore Rwandan Genocide: Classified papers show Clinton was aware of 'final solution' to eliminate Tutsis". The Guardian. Retrieved April 12, 2016. ↑ 14.0 14.1 14.2 14.3 14.4 14.5 14.6 "Rwanda – UNAMIR Background". Peacekeeping Missions. United Nations. Retrieved April 10, 2016. ↑ 15.0 15.1 Prunier, Gérard (1999). The Rwanda Crisis: History of a Genocide (2nd ed.). Kampala: Fountain Publishers Limited. ISBN 978-9970-02-089-8. ↑ 16.0 16.1 16.2 "France declassifies Rwanda genocide documents". The Telegraph Online. Telegraph Media Group Limited. April 7, 2015. Retrieved April 10, 2016. ↑ Riding, Alan (July 20, 1994). "France Recognizes Rebels". The New York Times. New York, New York. p. A6. ↑ Destexhe, Alain (1995). 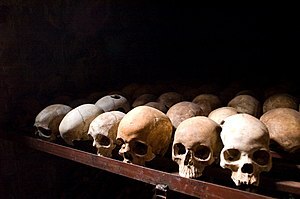 Rwanda and Genocide in the Twentieth Century. Translated from French by Alison Marschner. New York University Press. p. 54. ISBN 978-0814718735. ↑ African Rights (1995). Rwanda: Death, Despair and Defiance. London: African Rights. pp. 1151-54. ISBN 978-1899477036. ↑ Dallaire, Roméo. "Rwandan Genocide". Official Website of Lieutenant General the Honorable Roméo A. Dallaire. Roméo A. Dallaire. Retrieved April 11, 2016. ↑ Warner, Gregory (April 6, 2014). "How Abandonment in Rwandan Genocide Changed Peacekeepers' Role". NPR. Retrieved April 11, 2016. ↑ McGreal, Chris (December 18, 1999). "When the massacres started, UN troops saved white people: Chris McGreal, who witnessed the genocide in Rwanda in 1994, reports on the uncovering of UN failures to halt the murder of 800,000 Tutsis". The Guardian. Guardian News and Media Limited. Retrieved April 12, 2016. ↑ Schabas, William A. (2009). Genocide in International Law: The Crime of Crimes. Cambridge University Press. p. 572. ISBN 978-0521883979. ↑ Bryce-Pease, Sherwin (January 15, 2014). "Rwanda commander blames UN member states for genocide". SABC News. SABC. Retrieved April 11, 2016. ↑ "UN admits Rwanda genocide failure". BBC. April 15, 2000. Retrieved April 11, 2016. ↑ 26.0 26.1 26.2 Commander Romeo Dallaire (January 11, 1994). "Outgoing Code Cable – Subject: Request for Protection for Informant" (PDF). Unredacted. Retrieved April 12, 2016. This page was last changed on 3 October 2018, at 05:17.